Have you noticed sections of leaves that have seemingly been cut away your plants? A common springtime chewing culprit is the leaf cutter ant. Don't let the name deceive you though: Leaves aren’t the only item on their menu. They’ll also eat the flower buds and petals off your favorite blooming plants, such as roses! These crafty critters will cut way and carry off sections of leaves, buds and petals from a variety of plants such as weeds, turf grasses, fruit and nut trees, blackberry bushes, and many ornamental plants. Leaf cutter ants are most active during the day when temperatures are below 80F, but will work at night during the heat of summer. Despite what you might assume, the ant's aren't actually eating the leaves and flower petals; they are farming with them! The worker ants take the plant bits back to the main colony, where they use them raise a particular strain of fungus that is the primary source of food for the ants. They are very efficient farmers that can make quick work of your garden if there happens to be a large colony present. 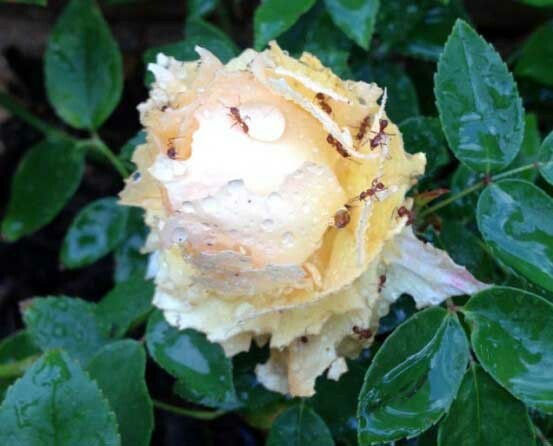 Often times the damage sustained in the garden is maneagble without treatment, however if the ants continue to cause a large amount of damage, they can be treated organically with ant baits or by applying organic pest control products directly to the plants.